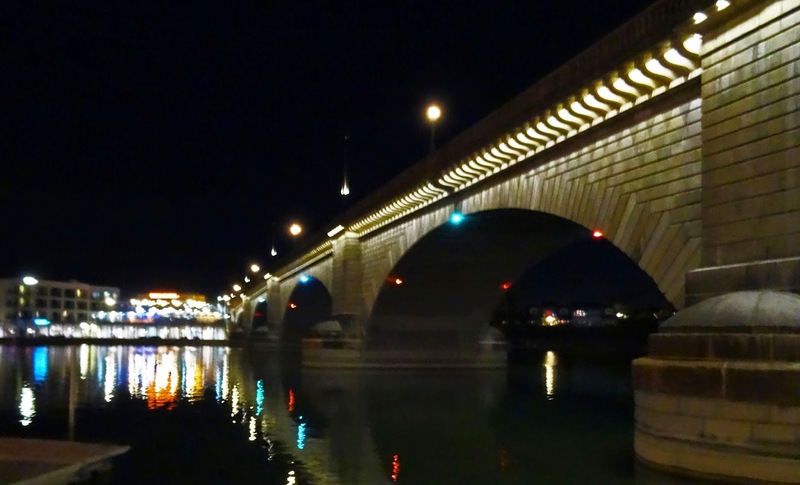 Greetings from Lake Havasu Arizona. We are hunkered down in the swanky 'London Bridge Resort' for a weekned full of BBQ, Music and Brews. This bridge is the actual real bridge from london. We are in the mood for some competition bbq. There should be over 70 teams this weekend. Stay tuned for more details. 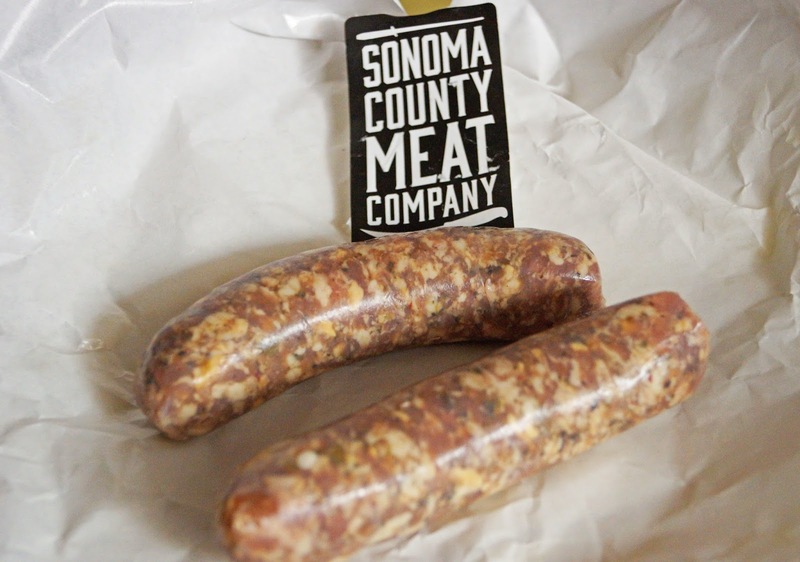 A new discovery to add to our Meat Adventure itinerary is the Sonoma County Meat Company. 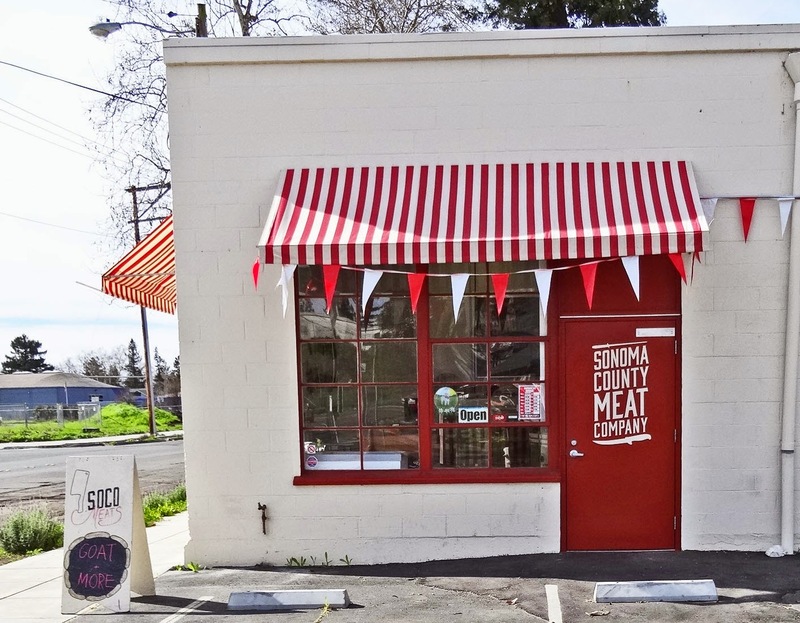 Rian Rinn and Jenine Alexander opened this butcher shop last year in Santa Rosa California. This is a full service meat shop. 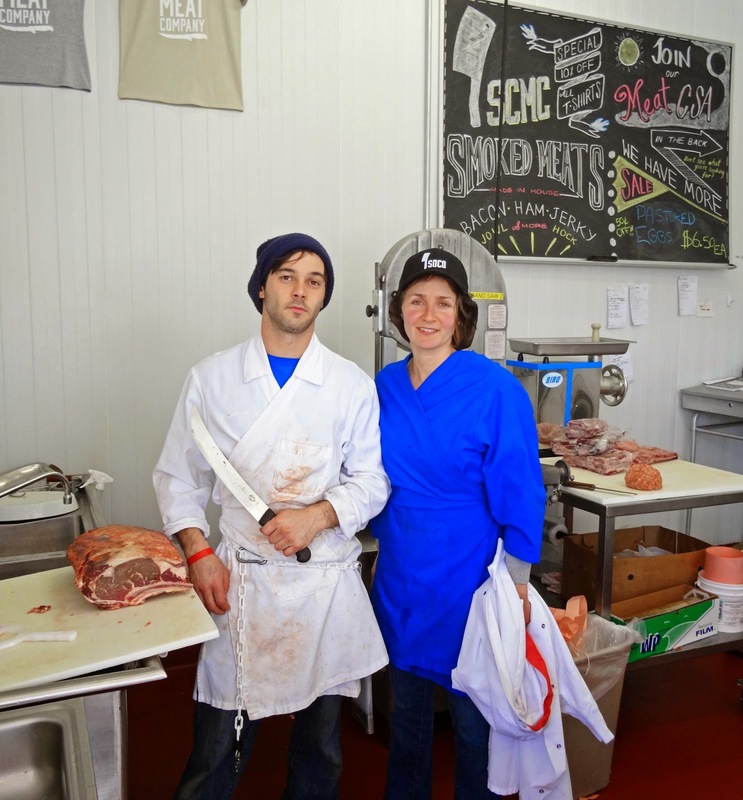 This is a one stop shop for local farmers to cut and wrap their meat needs. It also is a retail shop for the local public. They offer C.S.A. programs. 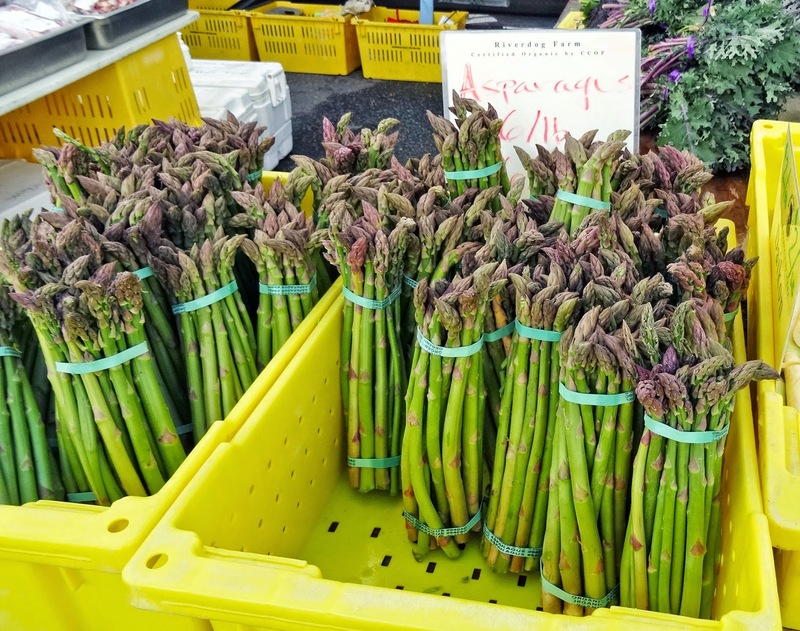 (Community Supported Agriculture). This gives the public an opportunity to buy a monthly subscription box of 5,10 or 15 pound assortment of meats. 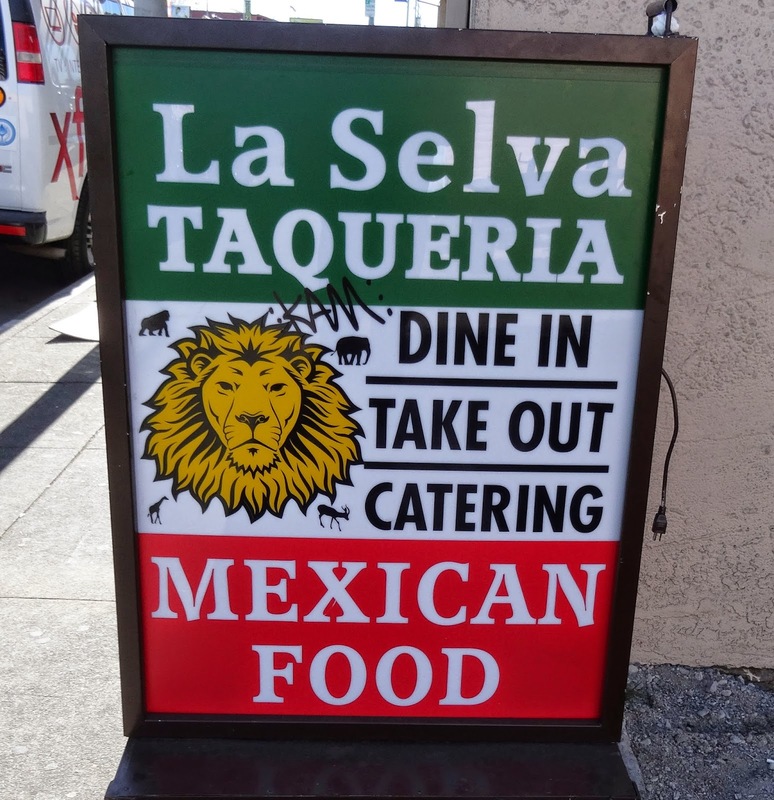 It is located on the outskirts of downtown so parking Karma was not needed this stop. The outside of the building is pretty non-descript except for a sign board announcing our destination. Once inside we walk into a familiar venue. A butcher is slicing and dicing various cuts of meat. 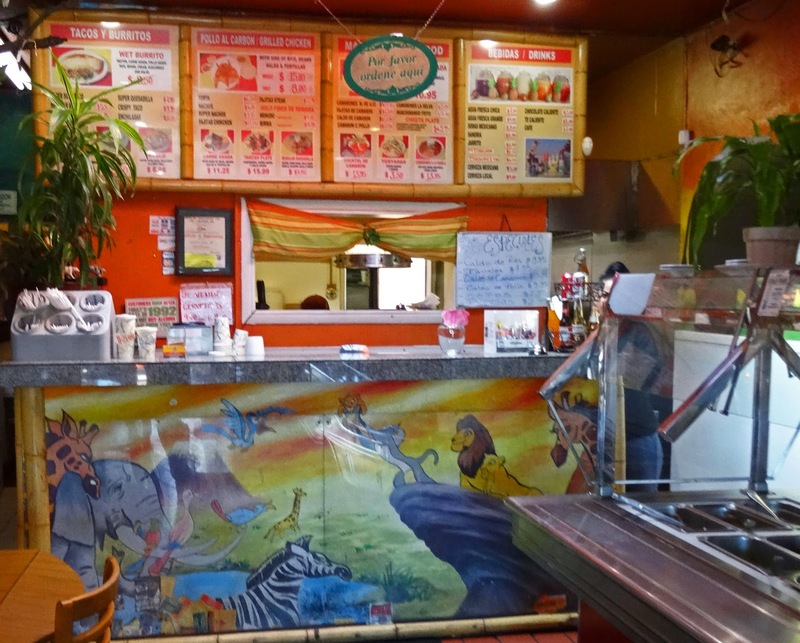 There are several meat cases displaying future eating pleasures. The variety of meat is impressive; sausage, bacon, crepinetes, beef (grass fed, grass fed grain finished) pastured raised pork and so much more. There was sliced bacon but we wanted slab so I asked the butcher/clerk. He called the owner Jenine Alexander who was in the back processing area. She came and brought me back to the working area of the shop. I also got to meet the other owner Rian Rinn. 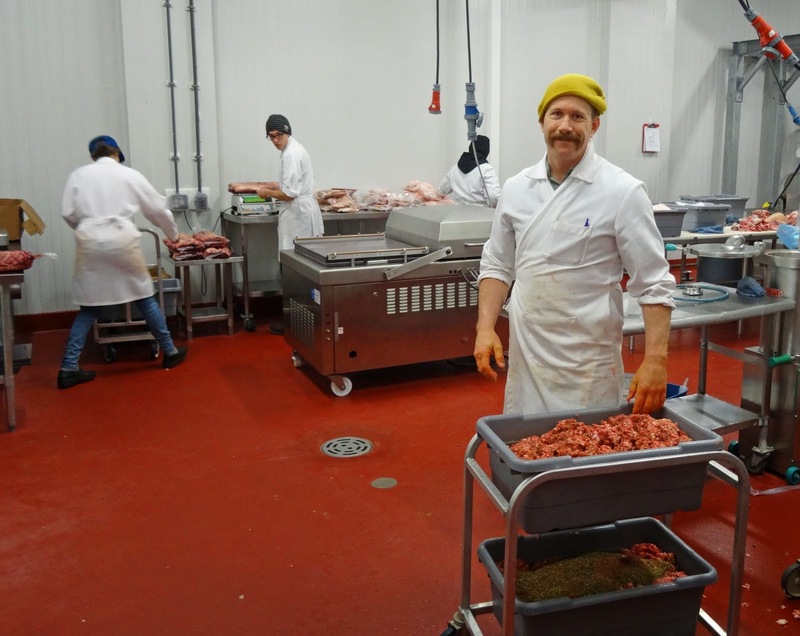 There were several employees’ busy making sausage and performing butcher duties. One thing I noticed was how clean this work area was. It was very impressive. 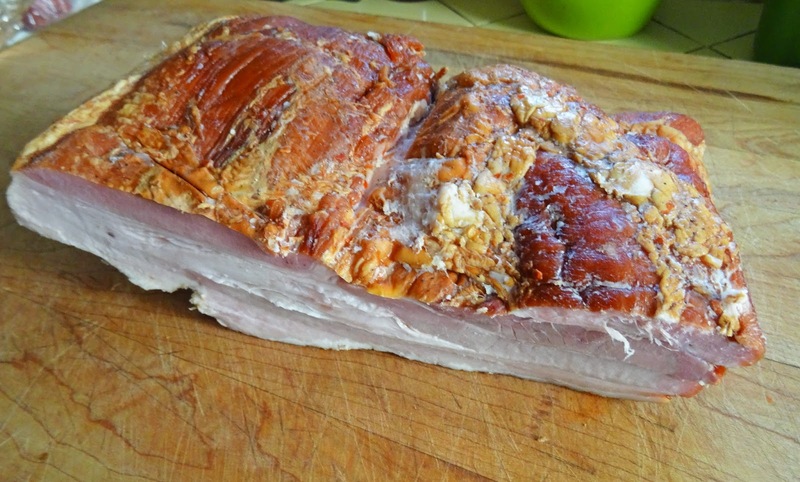 I also had my choice of some very nice slab bacon especially brought out by my request. We returned to the retail area to finish filling up our shopping cart. We purchased numerous meat items. One standout item was a Delmonico cut of beef. This was grass raised but grain finished beef. It was a treat for our bbq meal. The bacon was smoked to perfection. It had a very meaty flavor. We also had some jalapeno/cheese sausage that was only fair according to Ms. Goofy. She claimed there was not enough cheese and lacking jalapeno flavor. Two out of three is not bad. 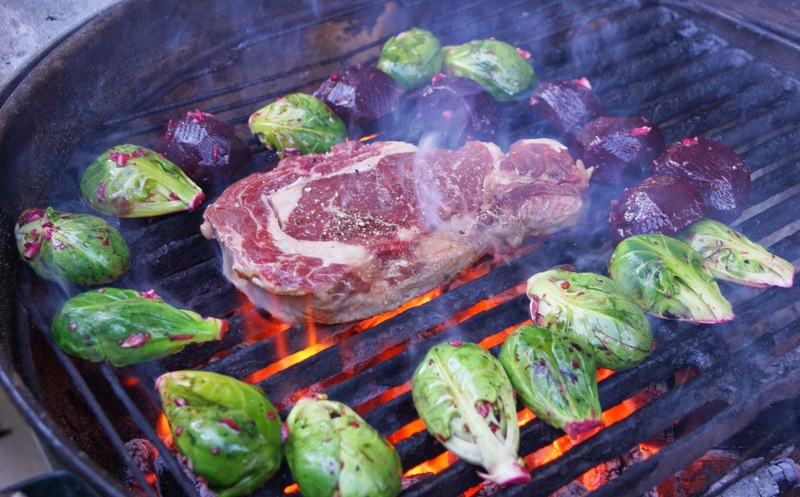 We plan to return to Sonoma Meat for future meat research. Thistle Meats in Petaluma California has embraced the 'nose to hoof' locally sourced concept. If that is your calling this is the place. This is our second visit, returning to sample bacon which was not available our last trip. Our last visit had mixed results. The best pickles ever, decent hamburger and shoe leather tough marinated flank steak was our trophies. This Meat Adventure an old salt mine cohort, 'The Great White Hunter' drove and provided comic relief. I am not sure if parking karma would apply because The Great White Hunter was behind the wheel but we did park very close to our destination. Bacon was available today. It looked decent enough. We had to cringe at the 16 dollars a pound price tag. I guess we were paying the hipster nose to tail locally sourced surcharge. This bacon was good but not worthy of singing praises of bacon hallelujah. That is because we found another bacon product at Thistle that was unique and very worthy of joyful celebration. Bacon Jam would save the day on this Meat Adventure. This jam was sold in small plastic tubs. I also bought some more of the best pickles ever. We do not have a lot of information on the bacon jam.. It was a sweet/savory bacony treat. Of course finely chopped bacon was the main ingredient. We also tasted the most wonderful caramelized onions. These two ingredients melded together to form a thick paste that when warmed was a heavenly decadent treat. The bacon jam had more smoke flavor than the slab bacon that we had purchased. 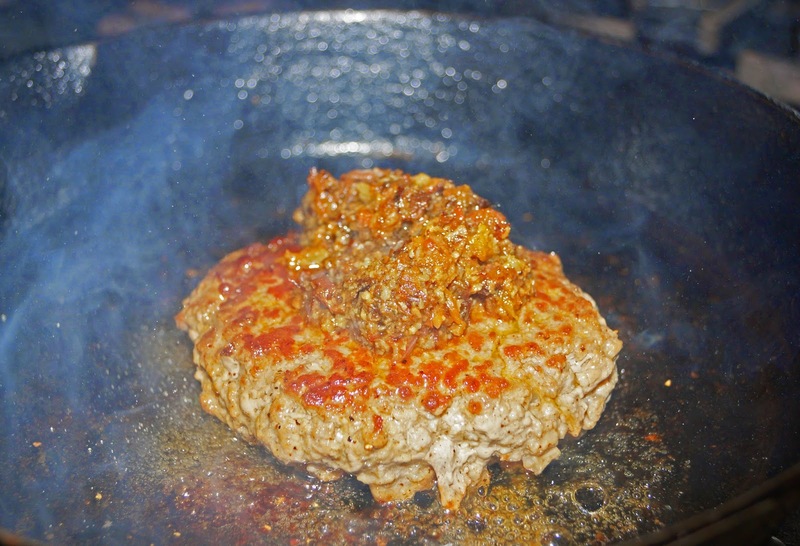 A healthy spoonful was placed on a cooking burger to slightly warm The combination of sweet caramelized onions, spices and smoky bacon just worked to compliment and elevate our burger. This jam was not only decadent but rich with bacon love. (fat). 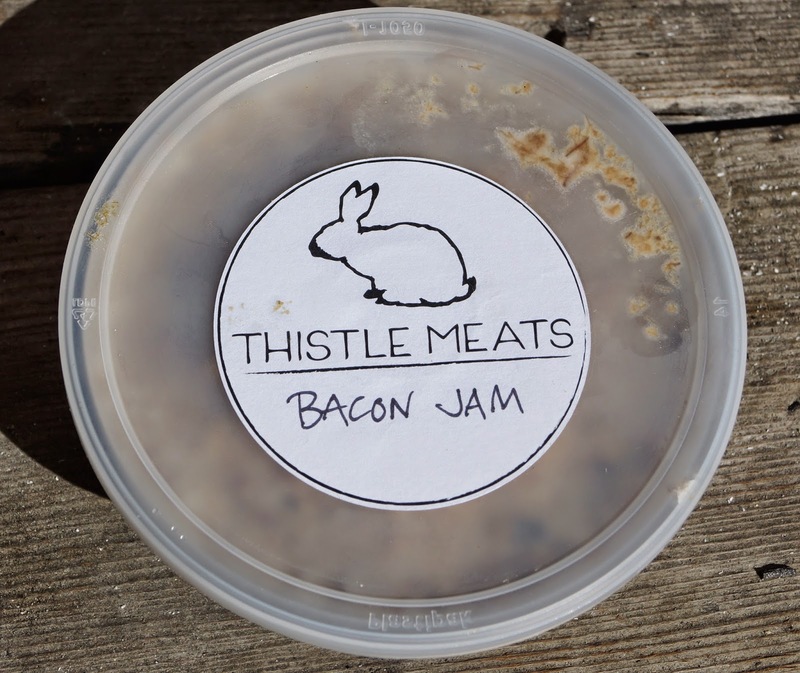 If and when we ever return to Thistle Meats bacon jam and house made pickles will be in our shopping cart. 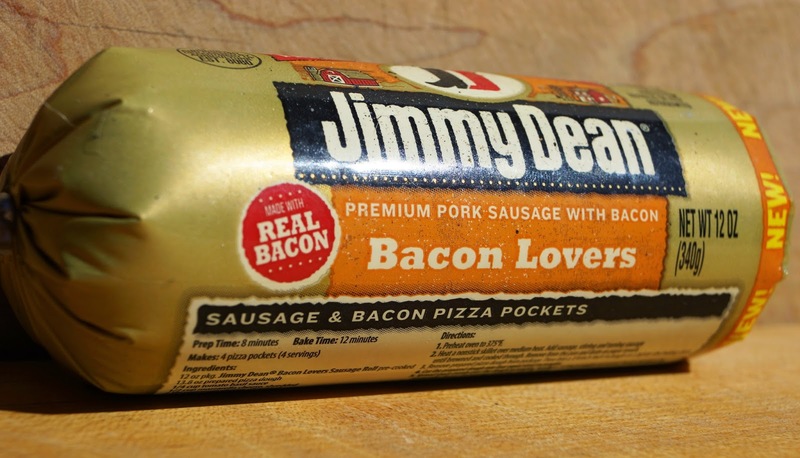 Our latest find in the world of bacon themed products is 'Jimmy Dean Bacon Lovers Sausage'. Jimmy Dean sausage is a secret guilty pleasure that we enjoy. 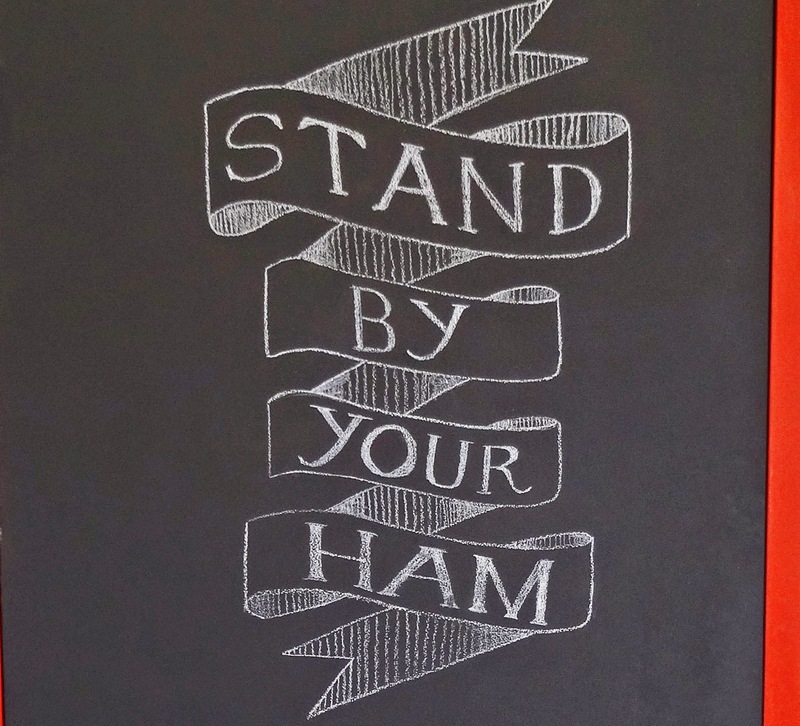 It is a flavor that we know and find comforting. With the addition of real bacon this sausage should be special. We found this item at Wally World. Actually it was located at a Super Wally World. Who knew that there was a super version of this store. To be honest we did not look at the ingredient list this time. Sometimes it is just better to just not know. We wanted to showcase this bacon product in an over the top way. 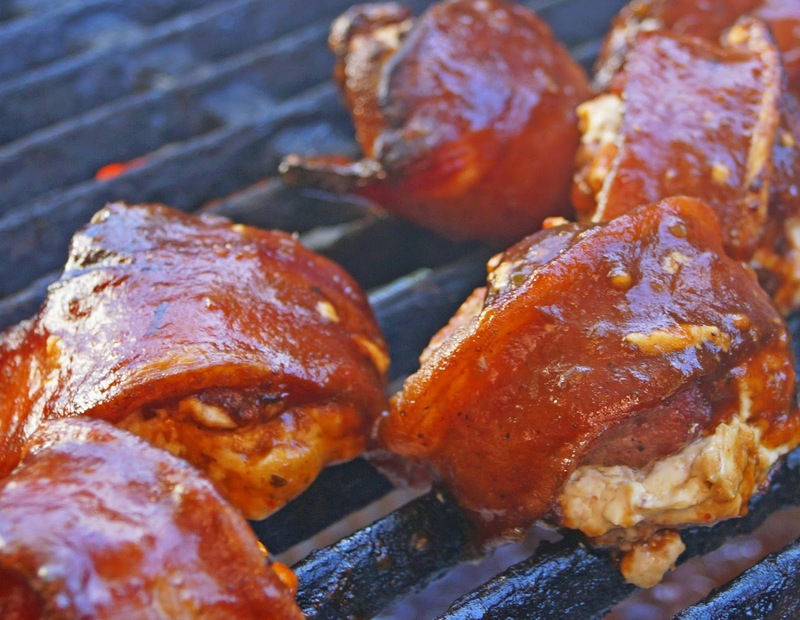 How about we grill on the bbq, mushrooms stuffed with bacon cream cheese, Jimmy Dean Bacon Lovers Sausage and all wrapped in bacon? This appetizer is a little involved but the results are stellar. Recipe Here. We will add a hickory smoke component with our Smokestack canister. This is a beautiful appetizer. It was a bacon overload of joy. 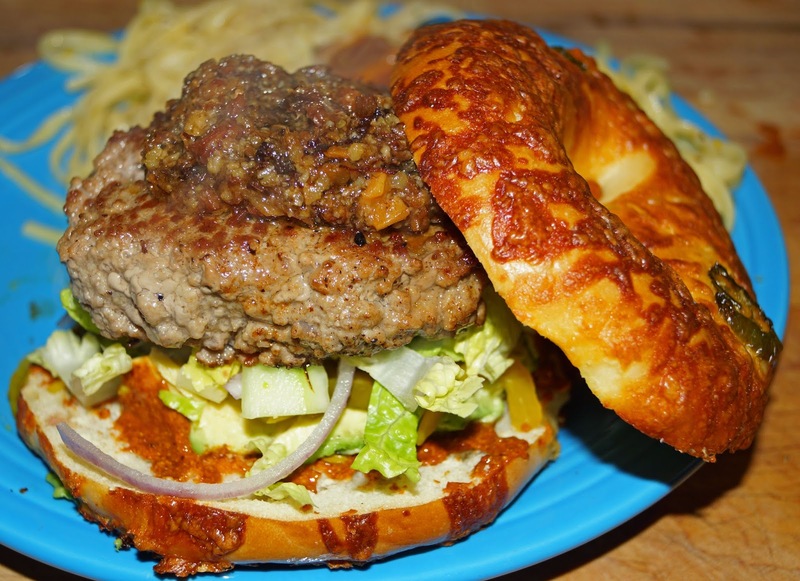 The sausage had a smoky bacon taste with the signature Jimmy Dean flavor. Bacon, Bacon, Bacon, how can you go wrong? We like this new product, As a rule we do not normally shop at Super Wally World but now we have a reason. When we return, Jimmy Dean Bacon Lovers Sausage will be on our shopping list. "Oh Lord We Thank Thee" Sometimes eating a steak can be a religious experience. This was one of those moments. Willowside Meats was the destination of my fellow Meat Adventurer friend; "The Great White Hunter". I was first through the door or maybe I shoved 'T.G.W.H. out of the way because I was first to see and purchase the most beautiful porterhouse steak ever. Even the butcher boasted what a great looking piece of beef this was. 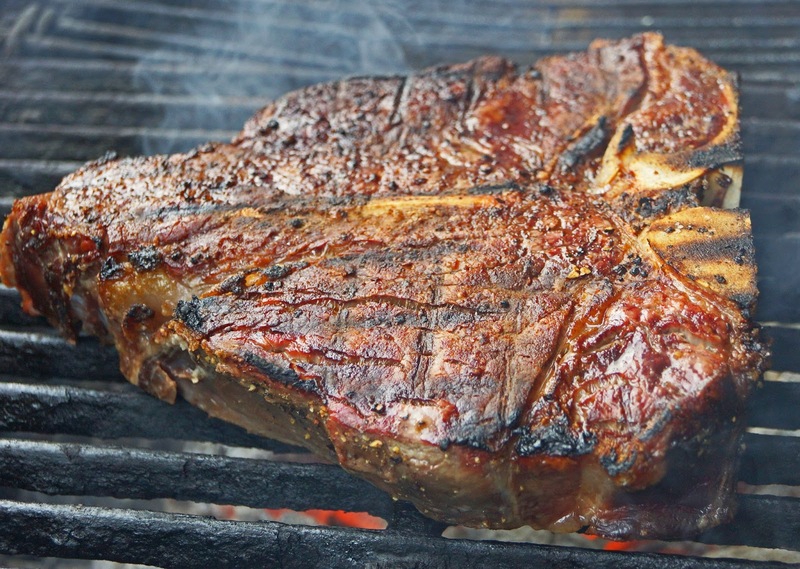 Dry-aged for at least 21 days, corn fed, USDA Choice beef a protein that we crave. No fancy pedigrees or pretension here. This is just great beef. This beauty was 2 inches thick and weighed a staggering 50 ounces. It was spectacular. In fact I would go as far as saying it was a 'Religious Experience". 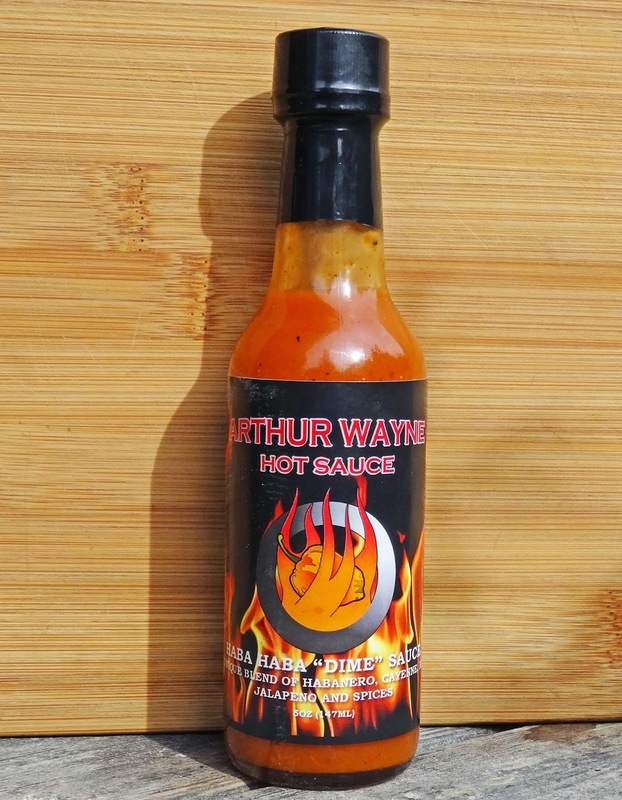 What do you get when you combine habaneros, cayennes and habanero peppers? How about we add some mango for sweetness and some spices too. 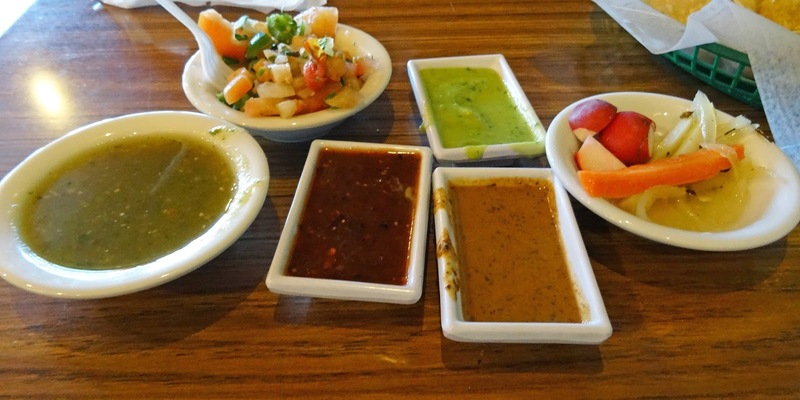 These ingredients meld together to create 'Haba, Haba, Dime Sauce. Have a look at the full review by the link below. As some of you may know I am a full pledged card carrying Chilehead. My garden is full of exotic chile pepper plants. One of these plants has the reputation and pedigree of being one of the hottest peppers in the world. This is the infamous Ghost pepper. This pepper will make grown men (me) cry with its blistering heat. 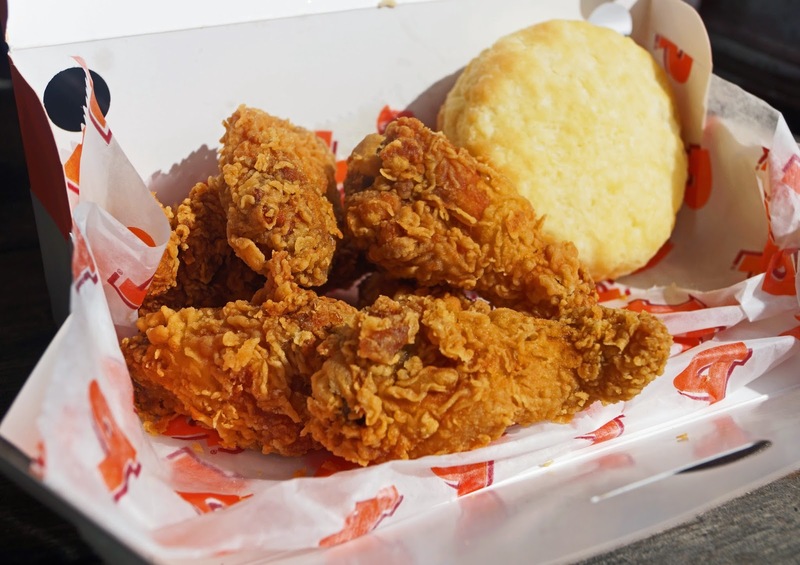 When I found out the fast food chain Popeye's has a ghost pepper chicken wing, I got excited. Normally I stay away from fast food but today I will make an exception. These wings were cooked to order. I have to admit they were kind of tasty. Crispy, salty, slightly oily crust that covered a tiny well cooked morsel of chicken meat tasted pretty good. But... I kept waiting for the bite and sting of the almighty Ghost pepper. Seriously when I cut open a pepper at home my eyes start to water from the fumes. This wing did not even raise an eyebrow in the heat department. There was a very slight hint or promise of warmth in the back of my throat. I would be generous to rate this wing mild on the heat scale. This was a fail in the Ghost pepper department. Here is another example of false marketing. Maybe they should call them Un-Ghost Wings. 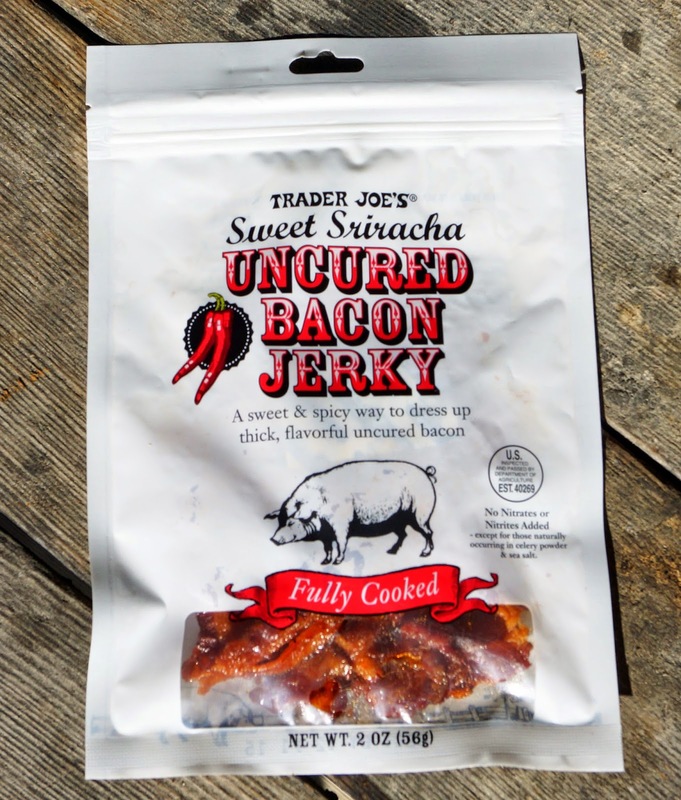 Trader Joe's, the bastion of shopping for everything you have always wanted but never need has enticed me to visit our local store with "Sweet Sriracha Uncured Bacon Jerky'. Is it that easy to just mention bacon to lure me into a buying fervor? Yup! This bacon jerky is everything that is promised. 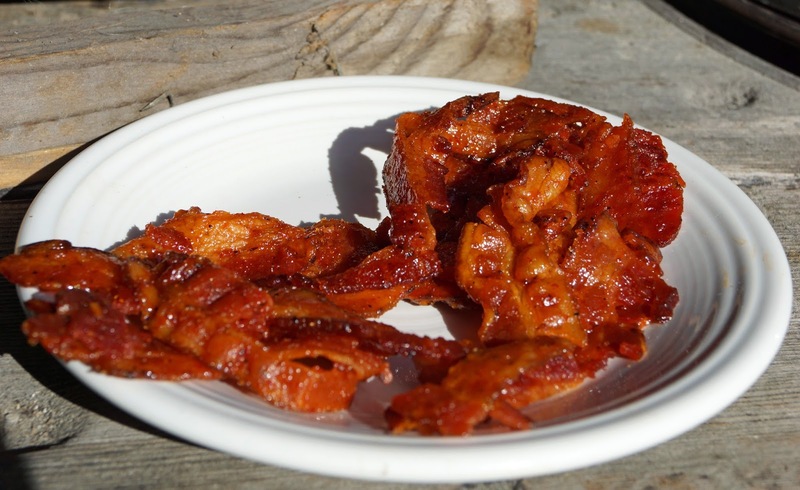 Sweet and very sticky Sriracha coats limp bacon strips with no refrigeration needed. It is a stretch to call it jerky but it tastes okay to me despite the texture. There is a slight heat from the Sriracha. This is a portable way to enjoy bacon on the go. Despite, liking the flavor, there is one huge problem with this product. WARNING: The Author is about to go into a Rant. Skip this section if you are faint of heart, sensitive or a misguided hipster Vegan. This product proudly claims to be uncured. Really? Let me quote from the ingredient list: "No nitrates or nitrites except those naturally occurring in Celery Powder and Sea Salt.". Excuse me Mr. T. Joe, but, our friend Merriam Webster states; "Curing.... to prepare or alter especially by chemical or physical processing for keeping or use" By definition you are curing with chemical albeit they are naturally occurring nitrates/nitrites from celery powder and sea salt. What kind of mumbo jumbo are you trying to sell us. 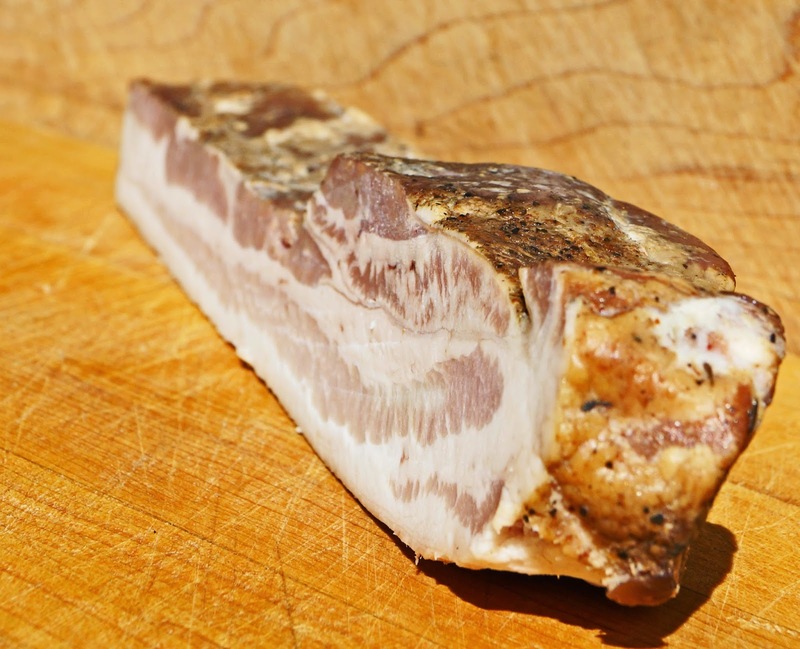 "Un-Cured" bacon is impossible. Oh my, my cranium is about to explode. Okay, enough of my Rant. We can all make our own decisions. This product is okay even though you have to be a blithering idiot to believe the packaging. Last summer we judged a local bbq contest in Martinez California called 'King of the County BBQ Challenge.' This was a great competition showcasing local bbq talent. Greg & Kerry were winners of first place chicken who also happen to own a small batch bbq spice rub company called 'Dog Day Spice Rub'. 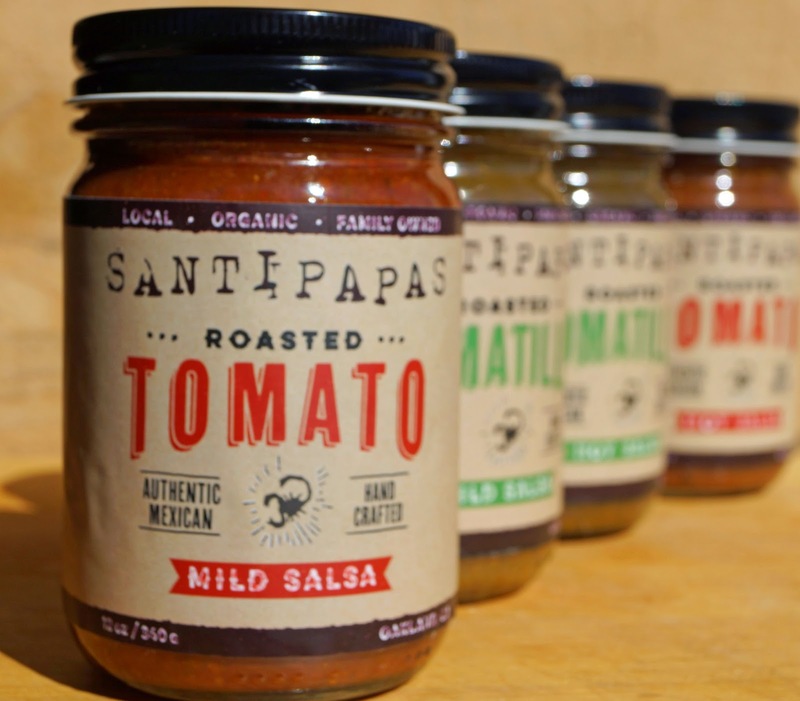 This company is more than just a business but a passion to help people make fantastic food. This mission statement rings true to my heart. Through social media we connected and I was sent this fun line-up of spice rubs. Dog Day Spice Rub makes six different unique rubs for different meat applications. Gluten free, no msg, no preservatives make these rubs flavor bombs in a package. A fun feature of these rubs is the label depicting a dog that has impacted Greg & Kerry's lives. Today we are sampling 'Jack's Paw Lickin' Rub'. Jack was their easy going black Labrador.. Jack's Paw rub was opened to reveal a very pleasant fresh spice aroma. I took a pinch to sample the flavor. The flavors were vibrant and fresh. The balance of peppers, spices and salt were balanced. This rub was mild with no noticeable heat from peppers. Of course, will all rubs, the test will be with the cook. 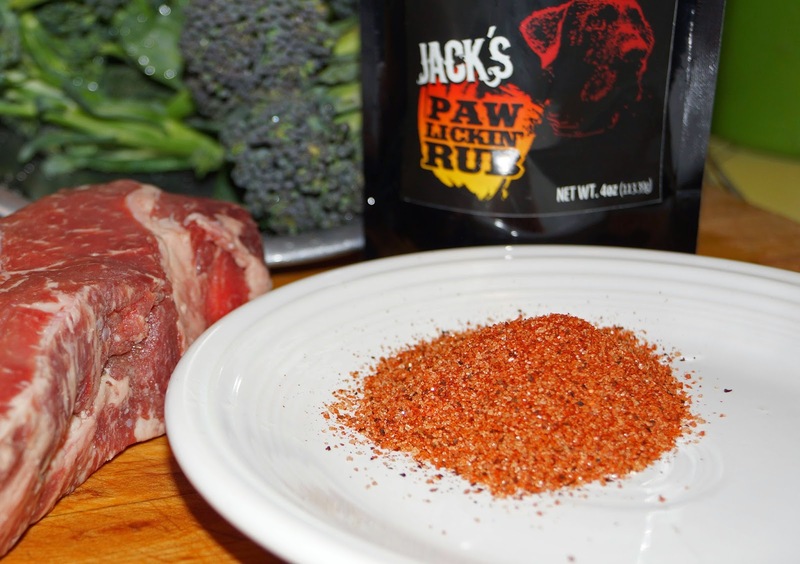 Jacks's Paw Lickin' Rub is an all purpose rub that is reported to work well with beef, chicken, pork, vegetables and even popcorn. 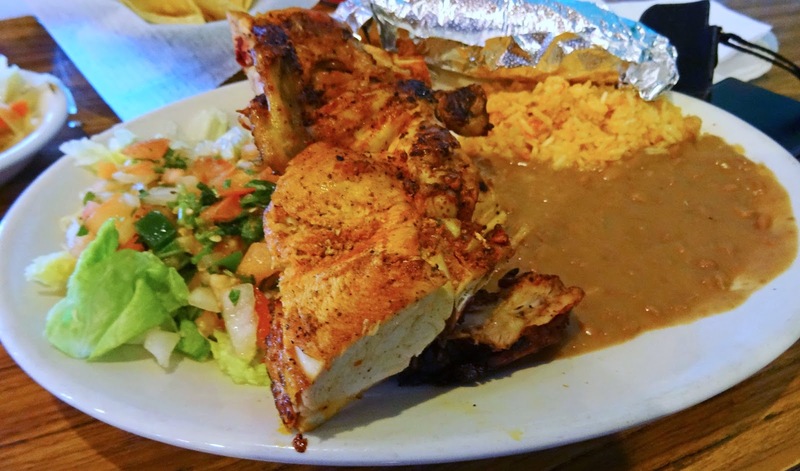 It did win first place with chicken in Martinez. We are going to use this rub with a steak and a very special American Kobe brisket. 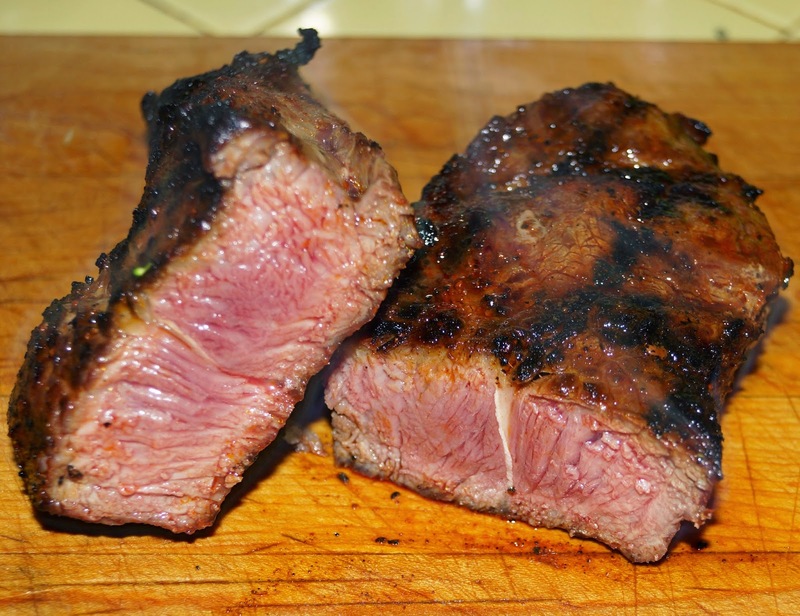 We rubbed the aged New York steak with the rub. It was cooked over a very high heat. The sugars caramelized and melded with the spices to create a crust that was scrumptious. This rub worked well to enhance our steak experience. Next was a very special brisket. I believe the image will speak for itself. This rub was one components of the best brisket experience we have ever had. WoW. 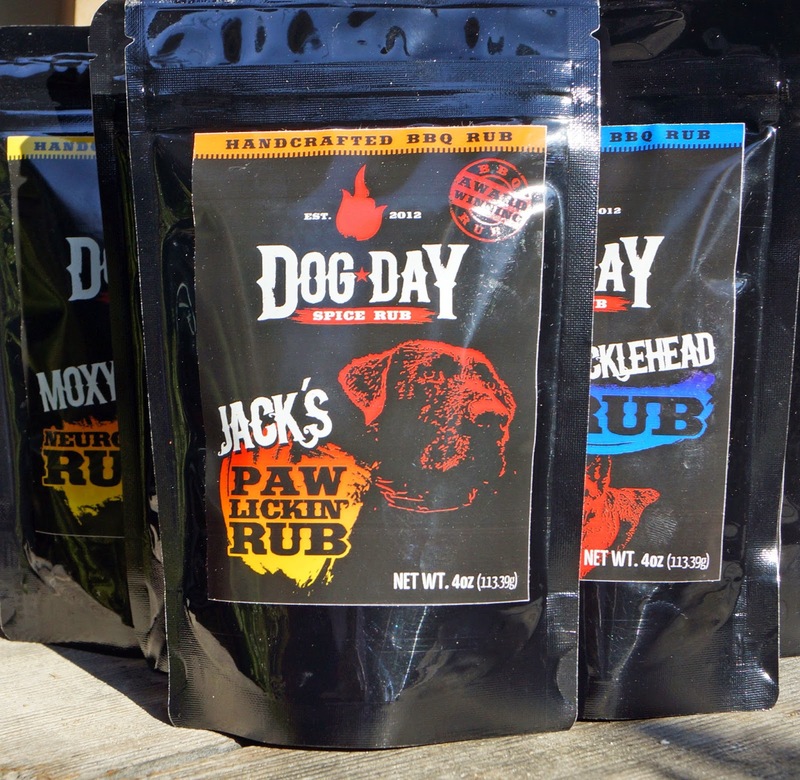 We really enjoyed Dog Day Spice Rub Jack's Paw Lickin' Rub. It is an all-purpose rub that we enjoyed on beef. It has won awards in chicken in our local bbq contest. 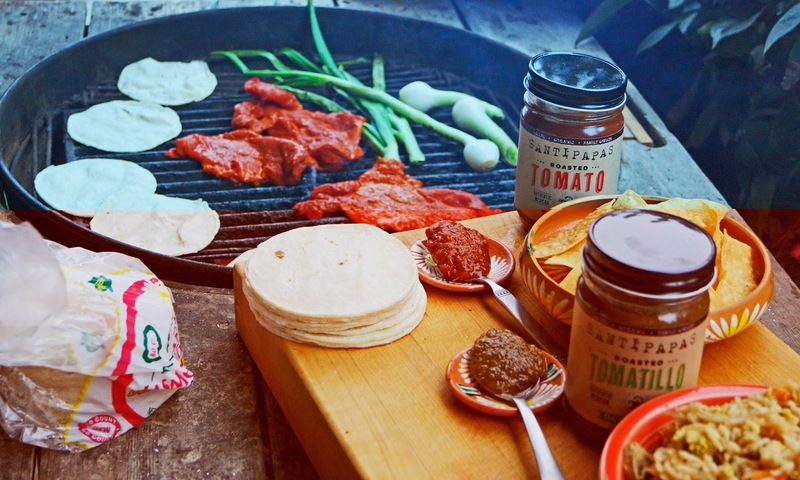 Dog Day Spice Rub company has a fun line-up of spice rubs that uses fresh and vibrant ingredients. 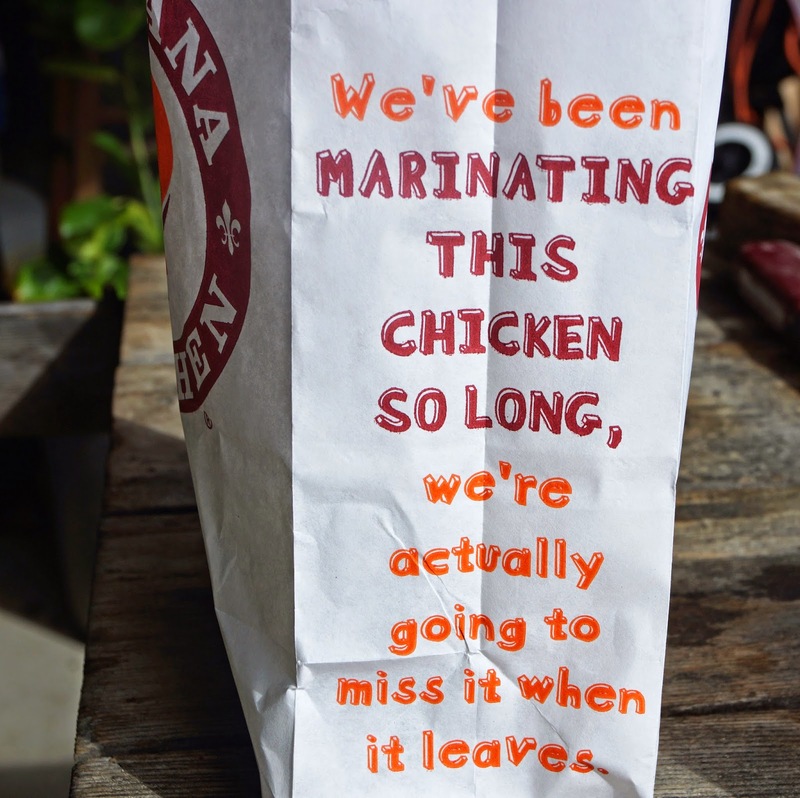 We cannot wait to explore some of their other unique and special rub offerings. Anybody that names spice rubs after their dogs is okay in my book. Our dog Lucy would love to have her own lineup of bbq spice rubs. Stay tuned for more Dog Day Spice Rubs. It was one of those moments. It was like discovering ice cream or chocolate for that very first time. That first little nibble of Snake River Farms American Kobe beef brisket was a sensory jolt of excitement that was amazing. Maybe we should start from the beginning. Ms. Goofy gave me the most wonderful Christmas present of a full packer brisket from Snake River Farms. 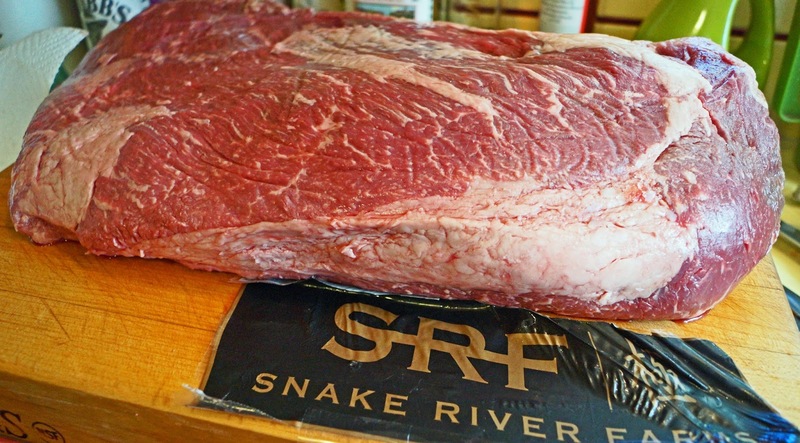 Snake River is considered the gold standard of beef in the competitive bbbq community and by chefs. American Kobe beef is from premium cattle stock that has been crossed with the infamous Japanese Kobe Wagyu cattle. It has been said the Japanese Kobe Wagyu cattle receive special care that includes massages and beer or sake. Our beef today has premium credentials with a price tag to match. This Christmas present was very special. The Super Bowl seemed like the perfect time to break out this special gift. To be honest I was a little nervous cooking this 13 pound piece of gold. I have cooked brisket in the past with mixed results. 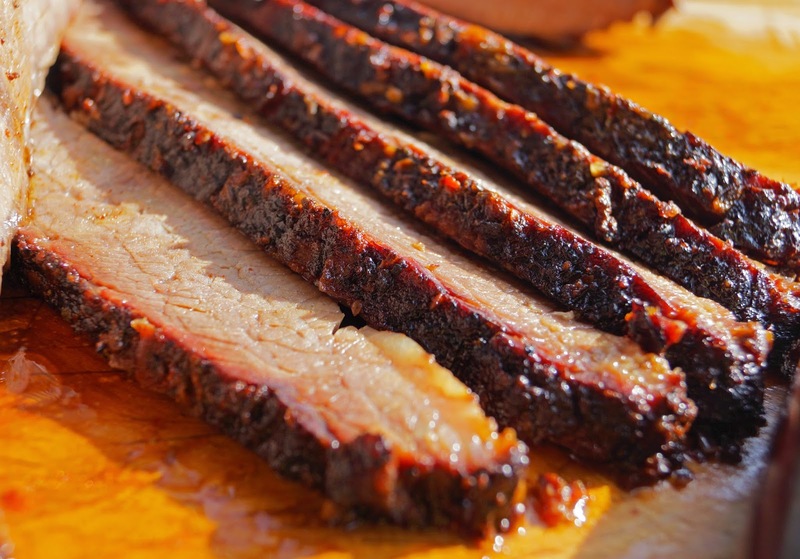 Brisket can be difficult to cook to maximize flavor and tenderness. I enlisted some help and pointers from my friends in the bbq community. They were more than happy to give advice and were excited for our cook. When you mention American Kobe from Snake River, people know that you have something special. I will spare you all the details of the cook because it is lengthy. I did trim the packer of the fat and reserved it for future hamburger duties. The Weber Smoky Mountain cooker controlled by the Stoker and fueled by charcoal, hickory and apple wood would be put into use. The alarm was set for 4;00 am Super Bowl morning. The outer bark was set and then the packer was wrapped. The internal temperature reached 205 degrees and the roast was pulled. 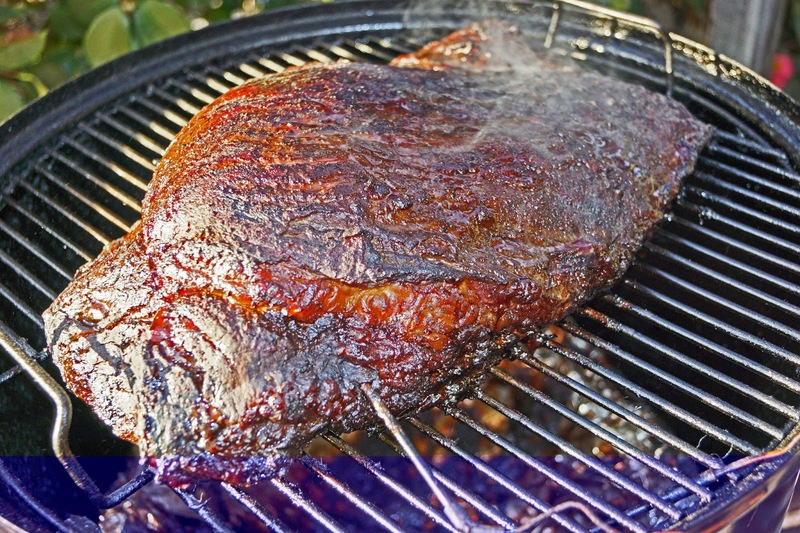 The foiled brisket was hidden away for exactly an hour: A very long hour. This was the moment we had been waiting for. I slowly unwrapped the brisket. Steamy essence of beef wafted through the wrapper. I am not sure if it was the steam or tears of joy but this was a beautiful brisket moment. I gently placed a carving fork into the brisket to lift it out of its rendered juices. 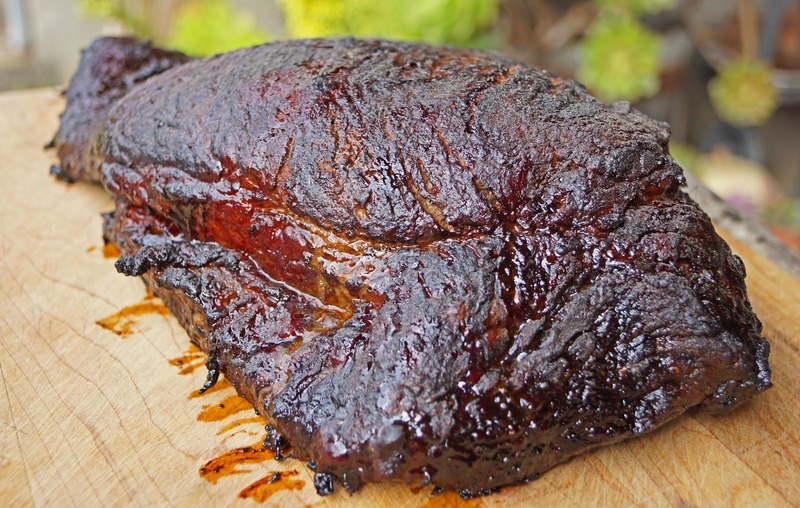 I lifted the brisket from the foil and set it on carving board. This brisket was so tender it jiggled as I put it on the board. It was that moment that I knew this was something special. The flat and point were separated. The point would be cubed and transformed into burn ends. (Meat Candy). The flavor of this meat was decadently rich. 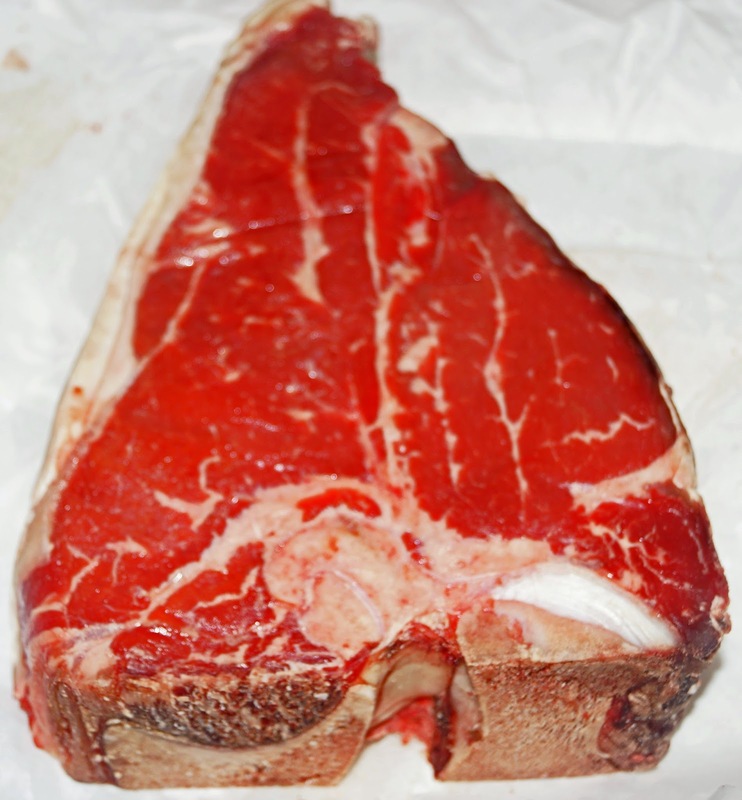 The slices and cubes had concentrated essence beef love (fat) with a butter like quality. Beef flavor was rich and soulful. I experienced the definition of swoon. I could place a piece of brisket in my mouth, close my eyes and actually feel a little light-headed with feelings of joy and pleasure. WOW. 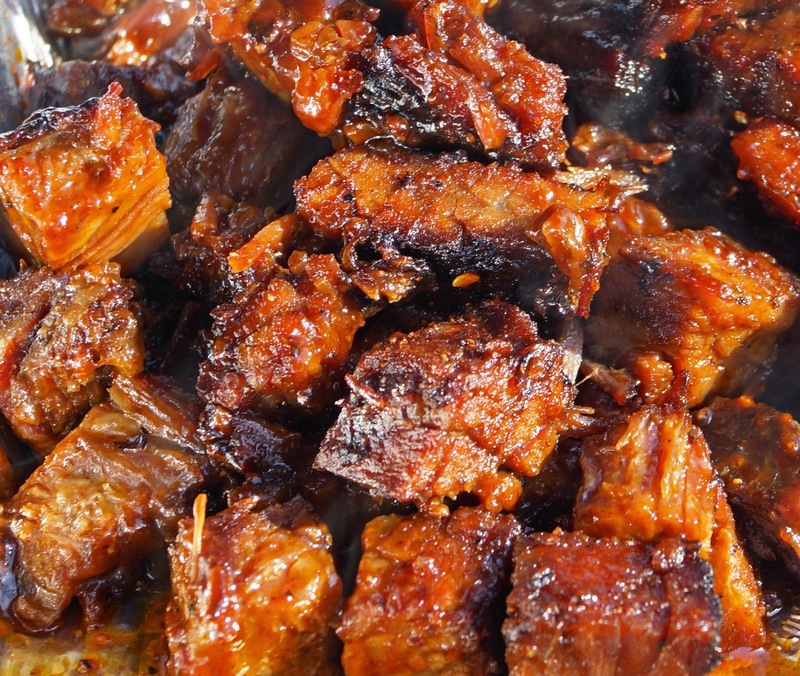 This was everything and more in brisket lore. Thankyou Ms. Goofy you are the best. 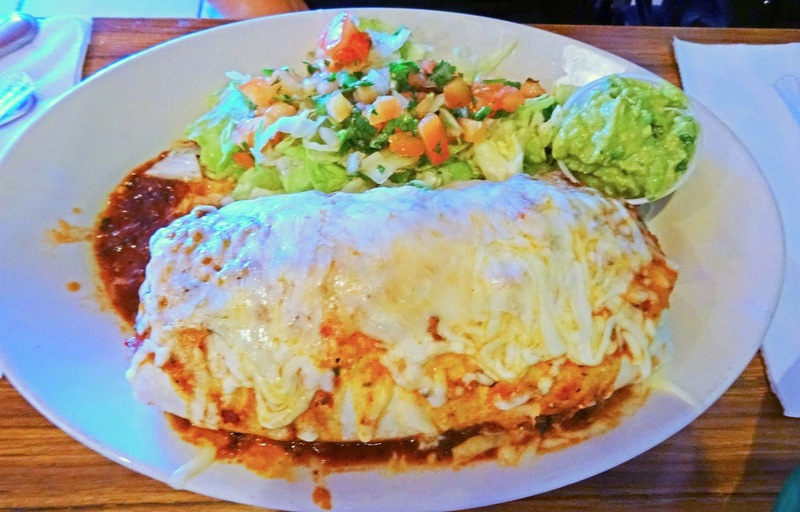 The Super Bowl deserves a super meal. Ms. Goofy gifted me a Snake River Farm brisket for Christmas. This is the coveted gold standard of beef (American Kobe Beef). It is one beautiful beast of a roast. I cannot wait for kick-off when this will be done. Stay tuned.